The names Arnold Palmer gave the fifth through tenth holes on the course he designed at PGA West here in La Quinta, speak volumes. They start with “Intimidator” at number five and continue to “Monster” at the tenth. They certainly present a challenge for most of us amateurs, but even more than that, they represent the wide variety of courses that are available to golfers in La Quinta and the surrounding communities. You can dial in virtually any “degree of difficulty” that suits your playing level. This diversity gives the homeowner another advantage. If you’re planning to move here, you’ll probably discover fairly quickly that your home will be a popular destination for visitors—your family and close friends. And if one weekend you have a newbie to the game visiting, you can head to a course that matches that skill level. Next, when you have scratch players come into town, you can set them loose on courses that will test exactly how long and accurate they are. To get a very detailed overview of your golf options—including both public and private courses—be sure to download our free golf guide. It gives you all the critical information you need and even serves as a general Palm Springs country club membership guide. The link is at the bottom. Now let’s tie two of our main interests together—golf and real estate. If you’re a golfer you want to see your numbers go down. If you’re a property owner, you like to see your numbers go up. Rising property values are good for owners and they reflect a healthy market. Recent reports show a strong market for both new and existing homes in La Quinta, Indian Wells and the general Palm Springs area. Year-to-year figures show that new home sales were up 19 percent in the Coachella Valley in February and median prices rose by about 25 percent for homes and condos. Solid figures like these are always reassuring for a community and a positive sign for prospective buyers. Further, with the variety of communities in the La Quinta real estate market, you always have a lot of properties to choose from. For example, within the gates of La Quinta Resort there are six communities, including The Mountain Estates and The Enclave, both of which feature large custom homes, as well as La Quinta Resort Spa Villas, which are condos near the spa. So, there are properties for virtually every budget and lifestyle. And if living in a golf course community isn’t critical for you, you’ll want to check out luxury gated communities such as Painted Cove, Puerta Azul, Hidden Canyon, Talante and others. So download our guide, look it over and give us a call. I think you’ll enjoy our positive and relaxed approach to helping you find the perfect property in La Quinta or the greater Palm Springs area. PGA West in La Quinta: The largest golf membership in the Palm Springs Valley. Planning to visit PGA West in La Quinta is a plan to visit one of the most storied golfing locations on the west coast. PGA West is a beautiful location that offers much more than 18 holes of golf and a clubhouse. The beauty and prestige of PGA West makes it one of the most memorable places to play golf in the world. 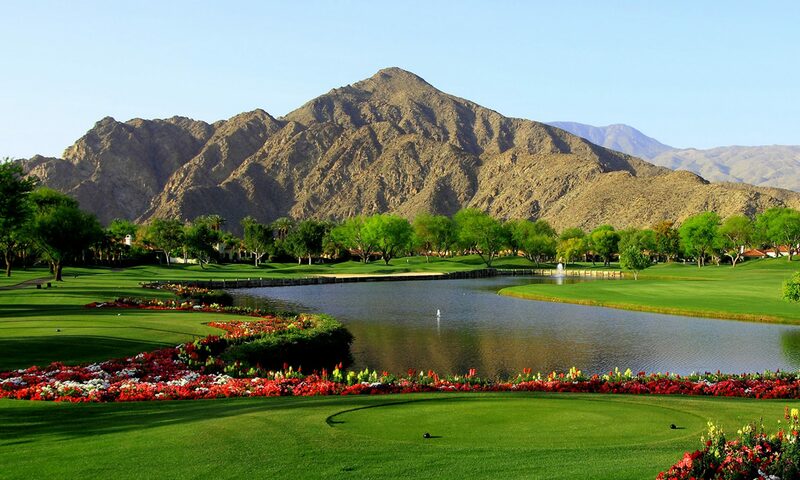 With 6 golf courses (108 holes), PGA West is the largest golf club in the Palm Springs valley. The La Quinta Resort, which is PGA West’s sister club, and Mission Hills Country Club in Rancho Mirage are tied for the second largest with 3 courses each. 3 of PGA West’s courses are private and 3 are public. When players tee up on the PGA West courses, the hills and mountains that have created the Palm Springs Valley are right next to the course. Rather than looking out to a beautiful view, golfers are a part of the view as the hills are so close you can touch them in some cases. The membership at PGA West delivers the biggest golfing selection for your money when compared to any other club in the valley. There is an upfront deposit of $45,000 and the dues are $1,145/month which includes unlimited play on all six courses and access to the member favorite Arnold Palmer and Jack Nicklaus private courses. You can pay a few hundred dollars more per month (with no long term commitment) to include the 3 courses at La Quinta Resort – therefore representing a membership to 9 world class golf courses for under $2,000/month, by far the best bang for your buck in the valley. Playing in the Palm Springs Valley is about more than just visiting PGA West once. These courses can be played over and over. Plus, the major tournaments, like the Humana Challenge, that are held here make for wonderful weekend escapes for the family to see great golf and enjoy the sunshine and clean air in the valley. Put PGA West on your list for a golfing adventure of a lifetime. If you have questions about the golf courses themselves or real estate in PGA West, please get in touch with us to discuss what it will take to move you from dreaming of golf heaven to living it. For more information on PGA West and all of our other beautiful golf courses in the valley please download our Golf Resource Guide below!